During the development of LCARS 47 version 6.5, we've decided to prioritize Drydock, the feature that allows a user to select their own class of starship to be displayed throughout LCARS 47. 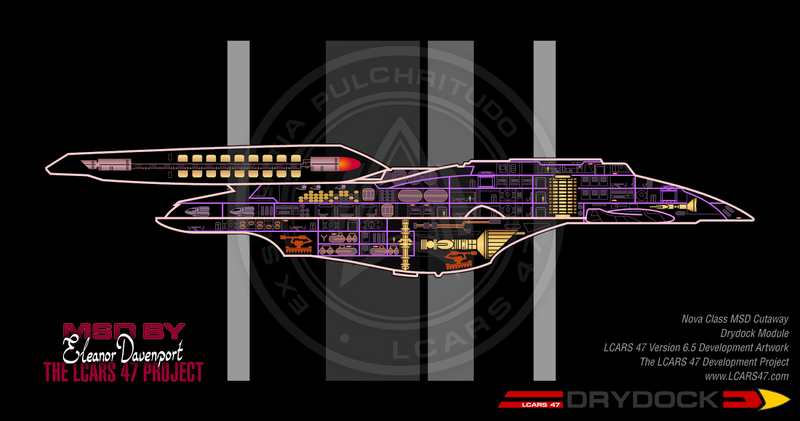 The previous incarnation of Drydock was admittedly limited due to the time required to design and animate cutaway diagrams. Well, that's changing in 6.5. Not only are we gonna release more ship class selections than ever, we're also thinking of including refits and variants further down the line. Moreover, Drydock III plugins will be even more detailed and even more animated. Here are two I just finished. They're ready for handing over to Lee for Quality Controlling before being approved for use. It's the Nova class (and its Rhode Island variant below), one of several classes on our highly classified list of inclusions (don't worry, the Sovereign, Intrepid, Galaxy, Defiant and Prometheus are confirmed).